If you were to chart the amount of swank in your life on a daily basis (line or bar graph, your choice), a night out during your city’s restaurant week should be off the charts. Most cities have one or two weeks during the year when participating high-end restaurants offer a special prix-fixe menu at a discounted price. This is so everyday folk like you and I can afford their quality offerings and enjoy them so much that we’ll come back later and spend way more money. But we won’t talk about that. Well, maybe when your parents visit. But that’s it. Worcester’s Restaurant Week(s) began August 1st and winds down this Sunday, so get on it! Low lighting and square plates await. Look the part by breaking out those tragically underused heels and swiping on some dramatically contoured eye shadow. Guys can wear shoes that are extra-shiny or use hair gel if they don’t usually use hair gel. In Worcester the night will still run you $23.11 (more in some cities), but this is a treat-yourself kind of occasion that comes but once a year (twice in some cities…)! For our crazy classy night we hit up Bocado, a Spanish tapas bar, which offered four courses to share between two people for $46.22– usually $75! See? Bargain. 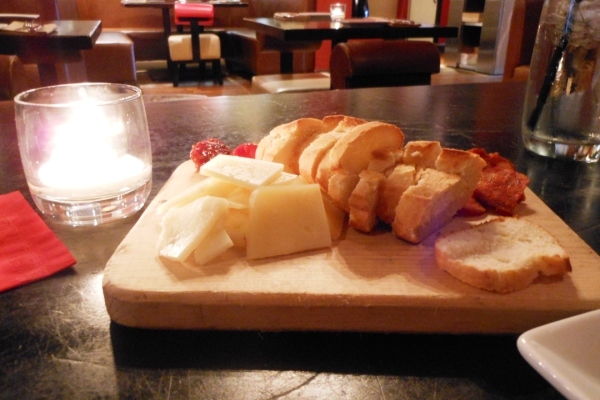 Our first course was a charcuterie board with Manchego cheese and chorizo. Charcuterie is a selection of meats or cheeses with accompaniments such as bread, jam or olives. Feeling fancy already! 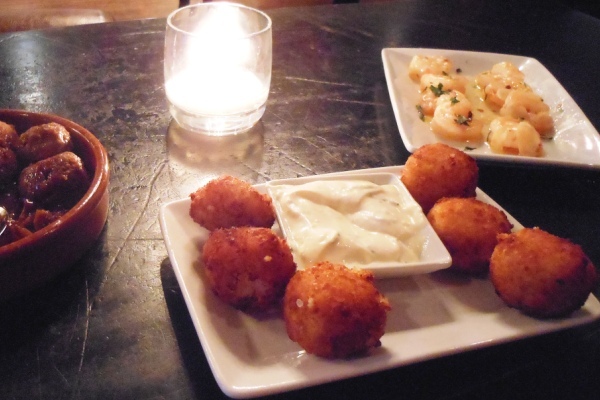 Tapas are small plates meant for sharing, kind of like appetizers. These are ideal for people such as myself who constantly long for a bite of everyone else’s meal. We chose pork meatballs with figs, blue cheese and red wine; fried, mozzarella-stuffed rice balls with basil aioli; and shrimp with garlic, olive oil and parsley. 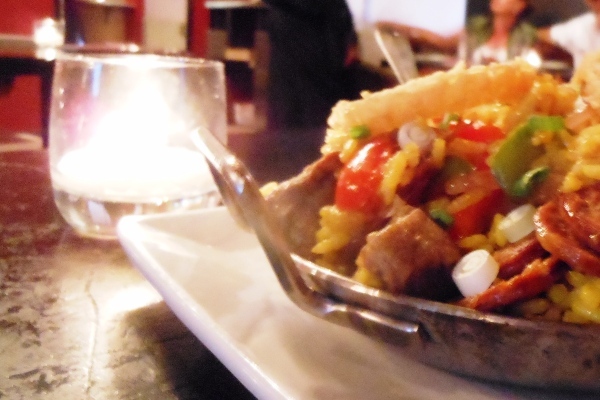 Next was paella, a Spanish rice dish that includes a mix of meats, seafood and vegetables. In The Small Kitchen has a recipe to try if you’ve never had it before. I was a first-timer, too, but this filling and flavorful dish really would be perfect for a party or crowd. Spanish dessert? 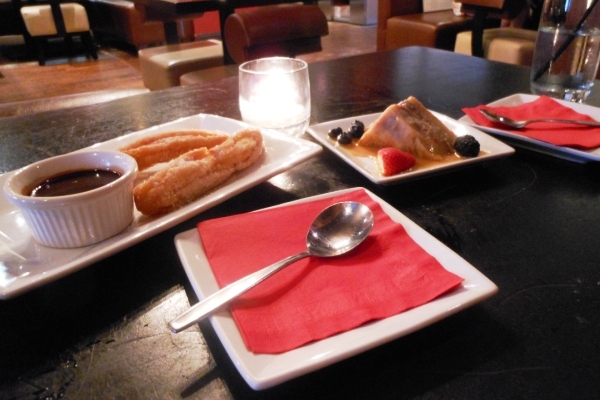 Churros, of course! With chocolate sauce that appeared at first to be a simple ganache (melted chocolate mixed with cream), but I will tell you, I ate every last drop of the stuff with a spoon. We were also dazzled by their white chocolate raspberry bread pudding. ‘Nuff said. Sigh. What a magical evening. Don’t forget to make the most of it by bringing home leftovers and ideas for ways to repurpose (or replicate) at home for a far more modest cost. Browse the specialty cocktail menu and take notes (or discreet photos). Get inspired by some of the flavor combinations like pork and fig or a new way to serve an old favorite (rice and cheese balls). Lastly, commemorate the night you looked and behaved swanky as heck with plenty of photos. Restaurant Week in your town! Google it! Jen Cantin is pursuing a Masters in communications at Clark University in the beautiful, yes, I said beautiful, Worcester, Mass. She enjoys alt-comedy and leftovers. You’re in point of fact a just right webmaster. The web site loading speed is amazing. It kind of feels that you’re doing any unique trick. Moreover, The contents are masterpiece. you’ve performed a fantastic activity on this subject!